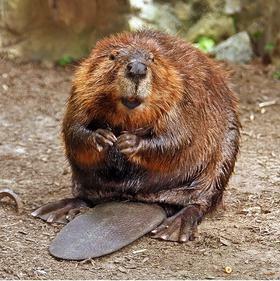 The North American beaver (Castor canadensis) is a master landscaper. More at home in the water than on land, it reshapes its landscape to suit its abilities. Beavers are busy, and the landscapes they create are the evidence. When natural sites are available, beavers burrow in the banks of rivers and lakes. But they also create good sites by building dams. They bring down trees with their strong teeth and powerful jaws to create structures that block streams and turn fields and forests into large ponds. A beaver family usually builds its home—called a lodge—in the center of its pond. Like a moat around a castle, the surrounding water keeps the beavers safe from most predators. Each lodge is home to a family of parents, young kits, and yearlings born the previous spring. The inside of a lodge is a pretty comfy place: the entrances are underwater, but the living spaces are above the water line. Wood chips on the floor keep things dry, and vents let in fresh air. 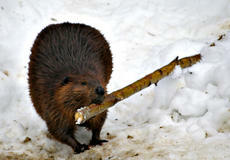 Even in the coldest weather, the temperature inside a beaver lodge stays above freezing. If you're reading this page from the Mississippi River Gallery at the Science Museum of Minnesota, look up at the big monitor. You'll see a live feed from the webcam inside the beaver lodge at the Minnesota Zoo. Built to chew. And swim.